It is essential that you have read Part 1, Part 2 and Part 3 of this series. Also useful is the definition of bid'ah and understanding that it is of two types (haqiqiyyah and idafiyyah) from the angle of how it relates to Shariah evidences (see this article, and this one). Al-Izz bin Abd al-Salam followed Imam al-Shafi'i's usage of the term 'bidah' upon its linguistic meaning, and this becomes very apparent when we see him entering innovation into the five Shariah rulings (wajib, mustahabb, mubah, makruh, haram). This actually makes the intent of al-Shafi'i even more clear and this is further evidence of the deception of those grave-worshipping Sufis of our times (and other than them) who try to confuse between the bidah idafiyyah (by which they oppose the Sunnah) and the other affairs which have been included into the linguistic definition of the term 'bidah' by the likes of al-Shafi'i and al-Izz bin Abd al-Salam and others. Note: al-Izz bin Abd al-Salam was not upon the way of the Salaf in creed and methodology, he was an Ash'arite, having Tajahhum, and was also a Sufi, and he has much that he can be refuted for. There is a good article on him here. Our intention here is to indicate that the five-fold classification of bidah spoken of by al-Izz does not support the Innovators of our times who use it (without understanding it) to justify departure from the Sunnah and opposition from the way of the Messenger (alayhis salaam). The position of al-Izz bin Abd al-Salam is well-known and he was the first to make this classification of bidah. He was followed in this by others such as al-Qarafi, and they were both refuted by al-Shatibi in al-I'tisam, which we shall take a look at shortly. Deception Alert: The innovators present the statements of some of these scholars like al-Shafi'i and al-Izz bin Abd al-Salam to the people by citing them through Ibn Hajar al-Asqalani's citation of them in Fath al-Bari (Kitab al-Tawhid), and they have a particular deceptive purpose in mind for this: To make it look as if Ibn Hajar al-Asqalani's view is one of total corroboration and acceptance, despite the fact that when we see the entire section, we see Ibn Hajar al-Asqalani's clarification of the matter shows that his view and definition of bidah (as defined by the Shariah) is one that agrees with that of al-Shatibi and that of the Salaf in general. This will be covered in a separate subsequent part in this series inshaa'Allaah. Bidah is of five types. That which is obligatory (wajib), such as being concerned with the [knowledge of] grammar by which the speech of Allaah and His Messenger is understood, because the preservation of the Shariah is obligatory, and it [the preservation] does not come about except through that, hence it becomes a precursor to what is obligatory. Similarly, explanation of what is obscure, strange (from the texts in terms of words), and compiling the principles of jurisprudence, and arriving at the distinction between what is authentic and weak [from the narrations]. The unlawful (haram), that which has been devised by those who oppose the Sunnah from the Qadariyyah, Murji'ah and Mushabbihah. The recommended (mandubah), every act of goodness that was not specifically established (maintained) during the era of the Prophet, such as congregating for the tarawih prayer, building schools and hospices (for the poor) and speech about the praiseworthy tasawwuf, and setting up gatherings for debate [to arrive at the truth] when Allaah's face is sought through that. The permitted (mubah), such as shaking hands after the morning and late afternoon prayers, and being liberal in taking pleasure through food, drink, clothing and abode. And some of that could be disliked (makrooh), or opposed to what is most befitting, and Allaah knows best. Waajib (obligatory): knowledge of grammar (to preserve the religion], clarifying obscure, strange words used in revealed texts, compiling and laying down foundations of jurisprudence (fiqh), speech in criticism and appraisal of the narrators to distinguish sound from weak narrations, refuting the innovations. Muharram (unlawful): the beliefs of the factions of innovations like the Qadariyyah, Murji'ah and others. Mandub (recommended): setting up hospices, schools, dams (or other structures for irrigation), every instance of goodness that was not found routinely in the first era (of Islam), the tarawih prayer, speaking about the detailed affairs of that tasawwuf which is praiseworthy, debate and discussion and gathering to discuss issues, where only Allah's face is sought. Makruh (disliked): decorating mosques, and decorating the Qur'an. Mubah (permitted): shaking hands after the morning and late afternoon prayers, taking pleasure in food, drink, clothing and residence, wearing shawls and widening the sleeves. It is important to inspect this list very carefully and to look at the things he has included here, and this will be made clear by looking at al-Shatibi's rebuttal and explanation of it. We can see clearly by the examples given that none of this supports the innovated matters of worship (be they haqiqiyyah or idafiyyah in terms of their innovatory status). And the Answer: This classification is an invented matter, there is no Shariah evidence which points to it (at all). Rather it is self-defeating, because the reality of bidah is that no Shariah evidence points to it, neither from the Shariah texts, nor from its principles. Because if there had been something from the Shariah which indicates the obligation (wujoob), recommendation (nadab) or permissibility (ibaahah) of anything, then it would not be bid'ah, and this practice would have been within the generality of the actions which are commanded (in the Shariah) or in which a choice has been granted. Hence, combining between these matters as innovations and between the [Shariah] evidences indicating theri obligation, reccommendation or permissibility is combining between two contradictory affairs. As for the makruh (disliked) or the muharram (unlawful), then it is acknowledged from the angle that they can be innovation, but not from another angle. Since if an evidence indicated the prohibition of a matter or it being disliked, that would not establish that it is a bidah because of the possibility that it is a sin such as killing, stealing, drinking intoxicants and what is like them. Hence, there is no innovation about which this classification can ever be imagined, except for [the two classifications] of being disliked and being prohibited, upon what is being said in the relevant chapter [pertaining to them] inshaa'Allaah. So what al-Qarafi has mentioned about the agreement about rejecting innovation is correct, but his classification therein is not correct. And it is strange that he cites consensus (on rejecting innovation) then he clashes against that with opposition (to it) alongside his awareness that (this position of his) makes the destruction of that consensus binding upon him! Al-Izz bin Abd al-Salam is saying that it is by referring the newly invented matters (i.e. linguistically, anything that is new, both praiseworthy and blameworthy) to the Shariah principles and looking at what they would enter into (of the five rulings), and so they would take the appropriate ruling depending on which one they would enter into. And this is what al-Shatibi indicates is pointless and self-defeateing, not having any purpose at all, since the bidah tha the Shariah intends can never be wajib, mustahabb or mubah. Later, al-Shatibi, discusses each example provided under the five categories and addresses each one (see below). And just as he (al-Qarafi) followed his Shaykh this classification without reflection, then it is apparent from Ibn Abd al-Salam that he labels the matters of public interest (al-masalih al-mursalah) to be "innovations" (البدع) built upon - and Allaah knows best - that they do not have any specific [explicit] mention in specific texts, even though they are conciliatory with the general principles of the Shariah. So from this (starting point) he made the general principles to indicate that these matters are deemed good. Hence, his referring to them with the word "innovations" (البدع) is from the angle of the absence of specific evidence for a specific issue, and then considering them as being good from the angle that they enter into [general] principles [in the Shariah]. And when he depended upon these principles, then these actions became equal to him to those actions which come under specific texts, and therefore he became from those who [simply] speak with the matters of public interest (al-masaalih al-mursalah), but he labelled them as "innovations" in wording, just as Umar (radiallaahu anhu) labelled the unification of the people for the prayer in Ramadan in the mosque as "innovation", as will some soon inshaa'Allaah. Al-Shatibi says that the affairs he entered under mandub (recommended) do not enter into innovations at all and that is clear by the examples which he gave. Salat al-Tarawih: This is established from the Messenger (alayhis salaam), and he quotes the narrations in this regard from the Sunan of Abu Dawud. He explains that the Messenger (alayhis salaam) stopped praying tarawih in the mosque after three days because he feared it might be made obligatory on the Ummah which may cause them hardship, citing the hadith of Aa'ishah (radiallahu anhaa) in Sahih al-Bukhari. Al-Shatibi says that these texts prove that this action was in fact a Sunnah, and that because the era was one in which revelation was still being received, he stopped it for that reason, it was not an absolute withholding. So when revelation stopped, the affair was eventually returned to exactly how it was, congregational tarawih prayer in the mosque behind a single imam. Al-Shatibi explains that Umar (radiallaahu anhu) called this action a "bidah" only on account of the outward appearance of the matter, in that the Messenger left it and it did not occur in the era of Abu Bakr (radiallaahu anhu). So when this word is used in this sense, there is no problem with such a term, however, this does not make it permissible to use this statement for permitting the blameworthy innovation that the Shariah condemns, because this is clearly distorting the words from their proper places (i.e. distorting the words of Umar). As for what he (al-Izz) entered into the wajib (obligatory), then the examples he gave are from the angle of the principle, "that without which an obligation cannot be fulfilled is itself an obligation." Hence, it is not a condition in these matters that the Salaf must have acted upon them, and nor that there must be a specific basis for them in the Shariah, because these matters and examples are from the subject of al-masalih al-mursalah (matters of public interest by which the five necessities, life, religion, intellect, wealth and lineage are protected). Al-Shatibee gives an example by saying that if a person was to travel for the obligatory Hajj by flying in the air, or walking on the water, he would not be considered an innovator, because the objective is to reach Makkah to fulfil an obligation. As for the example of the mubah (permitted) of shaking hands after the morning and late afternoon prayers, then as for saying it is an innovation, this is granted, but as for them being permitted (mubaahah), then this is prohibited because there is no specific evidence in the Shariah which indicates the specification of those times. Refer to al-Shatibi's lengthy discussion in al-I'tisam, we have only provided a summary of some of the issues he discussed but which serve as an illustration for them all. 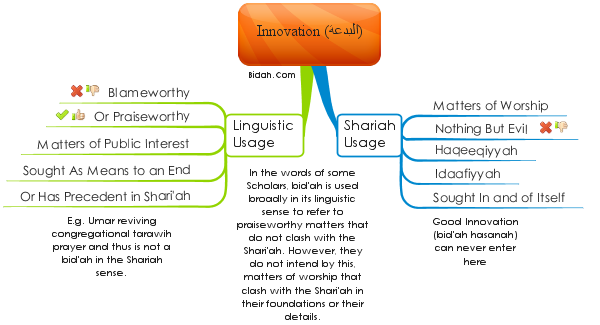 Alongside everything which has preceded which should now make clear that there is absolutely nothing for the Innovators in the mere fact that al-Shafi'i and al-Izz bin Abd al-Salam applied the word 'bidah' with its broader linguistic meaning which allows them (the innovators) to justify their reprehensible innovations in matters of worship, be they bidah haqiqiyyah or bidah idafiyyah. This will be made even more clearer by looking at some fatawa of al-Izz bin Abd al-Salaam in relation to matters of worship. Through this, we will illustrate that these contemporary innovators also misrepresent the position of al-Izz bin Abd al-Salam because even though he made an erroneous classification of 'bidah' upon its broad linguistic meaning into five types, he did not intend or mean by that what the innovators of today have wrongly employed this classification for, which is to oppose the Sunnah in the affairs of worship and to depart from what the Salaf were upon and to justify their multitude of innovations in affairs of worship not known to the Companions or the Salaf. In Part 5, we will look at a sample of fatawa of al-Izz bin Abd al-Salam to prove this point inshaa'Allaah.